What do you collect? Matchbox cars, old Jackie magazines, hats? In November 2009, a collector paid the princely* sum of $53,775 for a grey Fedora hat in a Dallas auction house. A lot for a hat perhaps but this hat had been perched on an infamous head – that of nightclub owner and murderer, Jack Ruby. 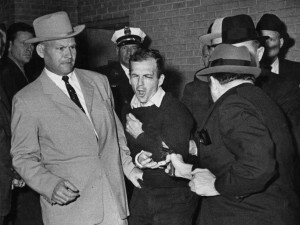 On Sunday 24th November, it will be 50 years since John F. Kennedy’s (supposed) assassin, Lee Harvey Oswald, was himself shot by Ruby. A plethora of conspiracy stories pervaded the world’s press: was it a simple revenge attack, or was Ruby a CIA assassin paid to cover up an internal coup? Whatever the truth, the events sparked off by the murder of the beloved president on the streets of the Texas oil town continue to fascinate the world today. You can see Glyn perform at Clitheroe Grand with his band Hence the Tortoise, supporting The Moulettes on Friday 15th November at 7.30pm. Tickets are £8 on the door.